You may exile a black card in your hand rather than pay Unmask's mana cost. Target player reveals his or her hand. Choose a nonland card from it. That player discards that card. Consider instead cards like Syphon Mind , which provides card advantage, and Unnerve , which scales well for multiplayer. I guess you should start by choosing either The Rack and Shrieking Affliction as a WinCon, or rather Liliana's Caress and Waste Not, that'll give the focus you need. I'd like to suggest replacing Phyrexian Arena with cards like Skeletal Scrying or Sign in Blood, that'll give you the option to choose when you're low on health. With the Arena you have no way of ridding yourself of it. Creature's like Tombstalker and Gurmag Angler are pretty good since you'll be filling your GY pretty fast. Quick double post, as this discussion got me brewing a bit. I’m also considering some “free” cards. 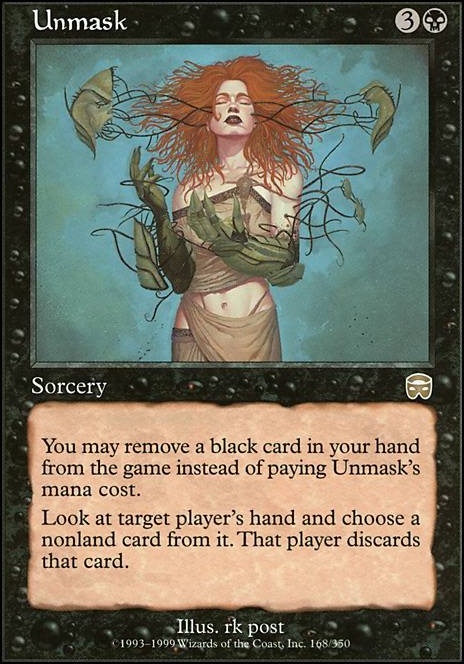 Unmask could be great as a way to protect ourselves on the turn we go off, and up our storm count by a few for no mana investment. Snuff Out can also up our spell count for free, while acting as another piece of interaction which this deck lacks to a certain extent. As always, cuts are more than just challenging - every cut in some way removes or diminishes other capabilities. This all bears consideration. If you have any cut suggestions, I’d love to hear them, with reasonings if you have them! 1) I don't see the value in running Vault of Whispers and Great Furnace. They are vulnerable to Wasteland/artifact destruction and aren't fetchable. If you were running Tainted Pact as an extra dig spell they would make sense (so you have a lower chance of hitting a card with the same name; e.g., Swamp). However, with only 7 basic Swamps your Lake of the Dead is going to often whiff. 2) Unmask is loss of card advantage. 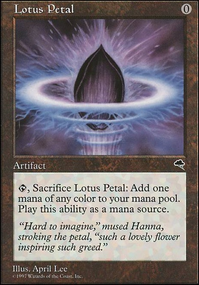 If it acted as a discard outlet instead of exile it could be useful for pitching a combo piece out of your hand before casting Doomsday but, exiling a card as the cost just feels bad. 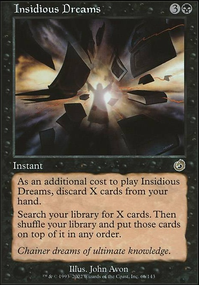 3) Cutting down the already limited pool of creatures from 12 to 10 makes using Diabolic Intent that much more difficult. 4) Are you using Ricochet Trap to target itself with a counter or using it to save an artifact/creature from destruction? Casting for 3 CMC seems heavy for this deck for a spell that isn't a board wipe. Using it as a counter spell target seems okay since it's just R to cast but, I would run Defense Grid over Ricochet Trap all day long. Defense Grid also has the added bonus of adding to Metalcraft for Mox Opal. I'm interested in your Jadelight Ranger, Glorybringer, and Unmask. Chat enabled. Okay, Gush... what first comes to mind when I first look at the card? Non-mana alternative costs are good. 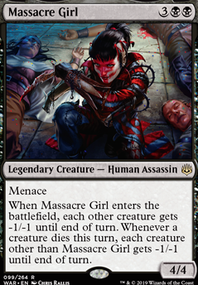 Like Unmask or Fury of the Horde, which get into combo territory, and getting things done quickly before you'd have to rely on having enough mana for it. Now I see a bit of the light. 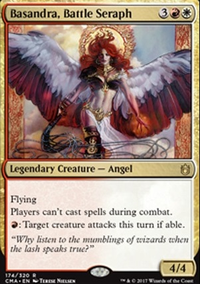 I should actually grab a playset of Opt, because it's a generally good card while wait to acquire its more... full-fledged fellows. I have Brainstorm, but hunting the others. I admit I didn't realize I was playing Brainstorm wrong until I read this article. 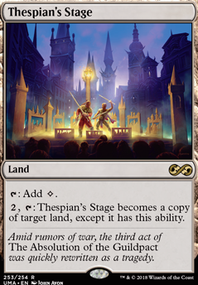 Always tried playing it early, waiting for more information and using fetches to get rid of the two cards I didn't like will certainly help. 1. Is there a consensus on the best splash? Currently I'm on white primarily for Wear/Tear as I think it's the safest splash for an unknown metagame, but I know that people have had success with the green and blue splashes as well. 2. Is Sire of Insanity still good enough? I know it used to be a staple, but I've seen a lot of recent lists that don't have it anywhere in the 75. 3. Chancellor is always a mainboard card right? I believe it is, but I have seen a couple lists that either don't play it at all or just have it in the board. Both seem wrong, but I'd be willing to try it if it if you guys have some positive feedback about it. 4. Any glaring omissions in my list? Like I said, I haven't played it in a while, but I don't think my list is that far off, it's mostly just the sideboard that I'm actually concerned about.